Villa Carmignano. The Villa is a typical Tuscan villa, found among the rolling hills between Florence, Prato and Pistoia. It is surrounded by splendid olive groves and vineyards. The Villa offers the possibility to relax in a peaceful and quiet environment, far from the traffic, but not too far from the beautiful cities of Tuscany, such as Florence, Pisa, Siena, Lucca and Pistoia. Thanks to the Villa’s fortunate location, guests can easily and quickly reach these famous art-historic cities as well as the Medici Villas of Poggio a Caiano and Artimino, and the Etruscan tombs in Montefortini a Comeana. The Villa dates back to the 13th century - it used to be the convent of the Church of San Biagio. The recent restoration maintained the elements of the original structure while updating and adding all modern commodities for guests’ maximum comfort. Space, Grace and Elegance are just a few of the words to describe this magnificent and luxurious property that has been restored to its original splendour, with careful attention to every detail. Antique, Tuscan furnishings complete the exclusive and comfortable setting. In addition to relaxing by the private pool, guests can enjoy the music room with piano, 42” flat screen TV with Satellite connection and billiards table. 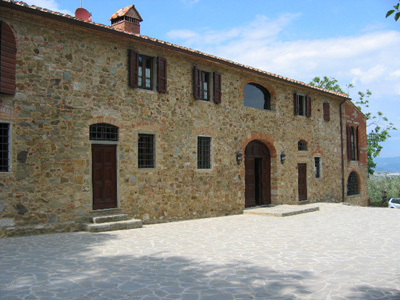 The Villa is a typical Tuscan villa, found among the rolling hills between Florence, Prato and Pistoia. It is surrounded by splendid olive groves and vineyards. The Villa offers the possibility to relax in a peaceful and quiet environment, far from the traffic, but not too far from the beautiful cities of Tuscany, such as Florence, Pisa, Siena, Lucca and Pistoia. Thanks to the Villa’s fortunate location, guests can easily and quickly reach these famous art-historic cities as well as the Medici Villas of Poggio a Caiano and Artimino, and the Etruscan tombs in Montefortini a Comeana. Bacchereto, about 1 km away.